Utilities around the world are racing to install “smart” utility meters, which are emerging as anything but smart. 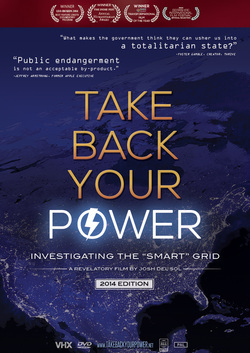 Josh del Sol’s award-winning feature documentary TAKE BACK YOUR POWER uncovers shocking evidence of in-home privacy invasions, increased utility bills, health & environmental harm, fires and unprecedented hacking vulnerability… and lights the path toward solutions. With compelling insight from whistleblowers, researchers, government agents, lawyers, doctors and environmentalists, learn why hundreds of local governments are standing against the rollout of this technology. What you’ll discover will surprise, unsettle and ultimately empower you. • Award-winning journalist B. Blake Levitt, author, Cell Towers: Wireless Convenience? or Environmental Hazard?